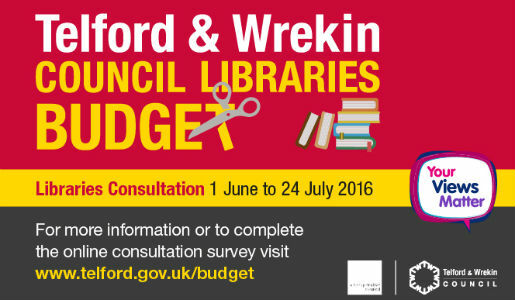 Now is your chance to have your say on how changes to the way libraries will be run in Telford and Wrekin will affect you. A series of roadshows starts tomorrow as part of the Council’s consultation on the future of its library services. At the roadshows you can speak to senior councillors or managers about the plans for the Council’s library services. Telford & Wrekin needs to make £30 million of cuts over the next two years due to continuing cuts in Government grant; £483,000 a year needs to be cut from its libraries. Earlier this year, the Council consulted on its budget proposals which included proposals to stop running six of its libraries. After listening to people’s views, the Council will continue to directly run Newport and Madeley libraries although differently from how these operate now. Community organisations have come forward with proposals to run Dawley, Donnington, Hadley and Stirchley libraries from later this year. However the Council must make changes such as opening hours, more use of self service machines and a potential to charge for some services such as ancestry. Alternatively use the online survey to tell us how these changes will impact on you. This is open until 24 July. Councillor Liz Clare, cabinet member for Culture, Sports. Parks and Green Spaces, said: “It is really important that everyone has the opportunity to have their say. We have found ways of keeping all six libraries open and we will continue to do all we can to protect our communities from the effects of these extremely harsh and unfair Government cuts.